Join us on this journey to the magical island of Bali for a whole 7 night RETREAT week to Re:Source yourself with nourishing and revitalising daily yoga practice, deep self care, rest and relaxation. We are excited to invite you to this sublime 5 star retreat, set in the north-west of Bali, a haven from the overcrowded chaos of the touristy south. Our accomodation, location, divine food and yoga are all outstanding. Bali's culture is deeply rooted in community, connection and creativity, embedded within and symbiotically connected to a dramatic and abundant tropical landscape. At Hamsa Yoga we believe these are perfect conditions in which to immerse yourself to Resource yourself and remember the fullness of your true nature. GET AN EXTRA $100 OFF! (MUST BE PAID IN FULL) ENDS MAY 12TH! On a yoga retreat, time seems to slow down and amplify, as we drop into the steady discipline of refining presence and attention with daily practice: nourishing body, heart, mind and soul. There will be plenty of time for both peaceful solitude and like-hearted connection, idyllic stillness and rejuvenating movement, activity and rest. All of the practices will be suitable for all levels of experience, and the limited group number (12 participants) will allow for plenty of personal attention in classes. There will also be plenty of time to relax: by the private pool or at the beach, whichever your heart desires. With a focus this year on skilful conscious movement, the schedule will include twice-daily sessions of yoga, meditation and more. Every day will begin with a flowing asana sequence, pranayama and meditation to greet the new day. Afternoons will vary from day to day, and will include: restorative yoga, yin yoga, somatic workshops, choice of free time activities including traditional Balinese massage; evenings may include yoga nidra and meditation. Sample daily schedule will be sent when you register. Jeda Villas is an exclusive and secluded luxury retreat, set amongst vast lush tropical gardens, at the edge of West Bali National Park, with a backdrop of stunning mountain views, just 900m from the ocean. The spacious yoga studio opens out to the gardens and mountains. There is ample generous space on the property for walks, solitude and tranquility. Luxury twin share room in the private villas, each with ensuite bathroom. There is a limited number of double rooms (for couples) available. The beautifully appointed private villas each have their own pool. All bathroom amenities are natural, organic and handmade in Ubud, Bali. Our private in-house chef and team prepare nutritious and supremely delicious vegetarian/vegan plant-based food; chicken and fish options are available on request. A generous tropical breakfast is served each morning. Lunch is included this year, and a selection of tea, coffee, fresh fruit, filtered drinking water, and fresh coconut water available throughout the day. A leisurely, delicious Indo/European dinner is served each evening. Special dietary needs are catered for. The food is an absolute highlight! North West Bali has a different feel to the South Coast or Ubud - much less tourism, traffic and foreign influence. It has retained its authentic charm and traditional culture. The locals are super chilled, simple, warm-hearted people, very welcoming and helpful. Pemuteran Bay is probably the best spot in Bali for diving and snorkeling - free of currents, the coral reefs are safe and exhilarating. Beaches are black sand and pebble, and safe for swimming. Pemuteran tends to have less rain than other parts of Bali, and is less hot and humid as its sheltered by mountains. Pemuteran is also the home of many important temples, a vibrant part of Balinese daily life. Local restaurants, cafes, galleries and Balinese gift shops. Bali's international airport is Denpasar. Air New Zealand flies directly into Denpasar in June, on Monday, Wednesday and Saturday. AirNZ, Jetstar and Virgin also offer codeshare flights via Australia from New Zealand. Keep an eye out for flight offers! Transfers (return transfers to Jeda Villas included) There will be group transfer pick up from two locations in Bali: Seminyak and Ubud, to bring you to Jeda Villas in Pemuteran. NZ/Aus Passports: Free Visa Stamp on arrival for 30 days - NO extension possible. *Other passports may have to pay Visa on arrival at Denpasar airport US$35 for 30 days stay. A senior qualified yoga teacher, Katy has practiced yoga in various styles for over 20 years, more recently specialising her focus with Embodied Flow Yoga™ and Yin Yoga. A natural communicator and connector, Katy takes you on a journey beyond the everyday ordinariness of being human, into the extraordinary qualities of being. Katy is a freelance yoga teacher and artist in Mangawhai NZ, and creates popular retreats, workshops and events in New Zealand. Our retreat begins on Thursday September 19 with your arrival at Jeda Villas. The retreat concludes on Thursday September 26. This allows you time to arrive in Bali, rest and recharge before making your way up to the retreat from transfer pick up points in either Seminyak or Ubud. It also allows you the opportunity to add on a few days of your own itinerary post-retreat: shopping, art and culture in Ubud, or exploring beaches or tourist spots on the south coast. Cancellation before June 30 2019 will receive a refund minus the deposit. Cancellation after June 30 2019 no refund, unless your place can be filled. You will receive a registration form to complete and return, along with details for transfer of deposit. Upon registration you will be sent more information about getting to and around Bali, transfers to Jeda Villas in Pemuteran, what to bring, etc. Seven nights’ accommodation - based on twin share rooms. 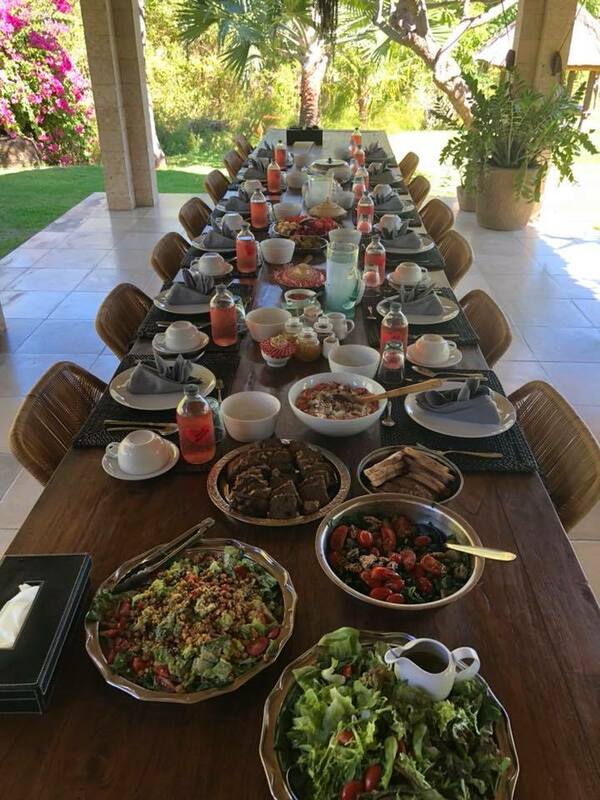 Daily brunch and dinner at retreat. Our chef is renowned for modern plant based indo/euro cuisine catering to all diets. Yes Yes Yes! Count me in! Email katycarteryoga@gmail.com to register now.